So I have a question. What percentage of your dinners are take out, restaurant or delivery? Are you like we were, back in the days when our commute dominated our lives in Howard County? Did you eat out more than half the time, every week? How about changing your percentages, to four days home. A 60/40 mix. Believe it or not, you can change to eating fresher, more “expensive” food at home. It just takes a little effort to change dining out from majority to minority. Something so simple as one more night in, instead of outsourced. I really love the protein and dairy bag from Friends and Farms. You can easily do four nights in, and still have three nights “out” with this affordable protein option. My $43 a week basket feeds the two of us, and provides us with the protein on our plates for at least four meals, sometimes five or six. There are chicken legs, chorizo, breakfast links and rainbow trout in our basket. 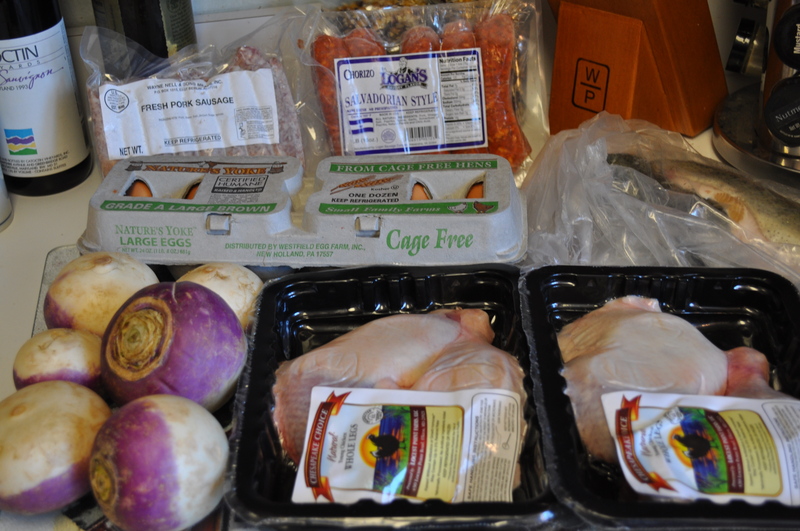 Along with the weekly eggs and, in our case we have turnips since we don’t do the milk thing. I can make two meals from the chorizo. Two from the chicken. We use the breakfast links in weird ways, like in tomato sauce or in soups. Not a big fan of pork for breakfast but these tasty links can be cut up and used in so many savory dishes. Eggs. For Meatless Mondays, they make great omelets or frittatas. But getting back to the original thought. You can make a very simple meal from the trout. One that would cost major bucks at a restaurant. Less than 30 minutes. How? Plop those trout in a baking dish. 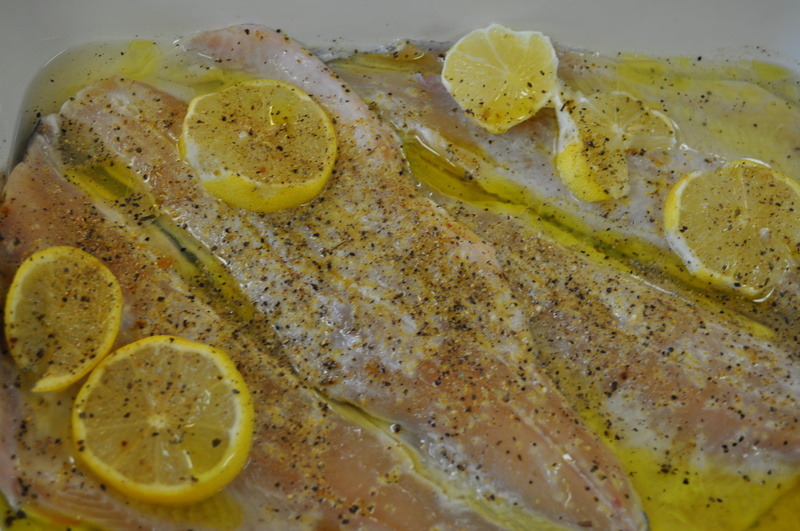 Cover them in lemon infused olive oil, white wine and lemon pepper seasoning. Bake them at about 300 degrees for 15-20 minutes. I made two simple side dishes. Boiled baby potatoes. Microwave steamed Brussels sprouts. Looks great, doesn’t it? 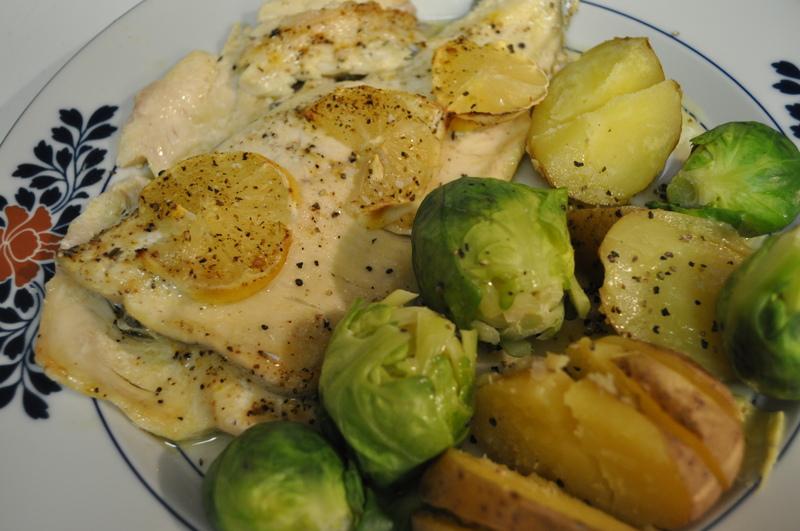 I put the potatoes on while prepping the trout. I steamed the sprouts two minutes before the fish was done. Open a bottle of white wine and you have an excellent meal. With a little effort, and a little help from Friends and Farms. Posted in Food, Friends and Farms, Local Businesses, Locavore, Real Food, Winter Eat Local and tagged cooking, Food, foodie, hoco loco, local businesses, Locavore, real food. Bookmark the permalink. We don’t eat out much, be it carry-out, delivery, or eat-in. I am off on Sundays and Mondays and work the remaining 5 days of the week. On Sundays we usually have a ‘late lunch’ while we are out and about and a light snack that evening. On Mondays, I cook something to take to work for my meal break the rest of the week, as well as something else for our dinner that evening. Even on vacation, we try to get accommodations that will allow us to cook our own meals. I had to bite my tongue when the doc relaying my son’s cholesterol results (someone who did not know us) said to “lay off the fast food”. It got me thinking, when was the last time we ate fast food? I know we went out to Five Guys in September before my spouse deployed . . . I cook most meals at home. I get sick of cooking most meals at home, so usually a weekend lunch or dinner is either at a restaurant or carry out. My kids have (home cooked) leftovers for school day lunches. Eating out is a treat. We don’t listen to lectures about cholesterol readings. We know they really aren’t a problem. Our HDL levels are sky high, and that’s the good thing.